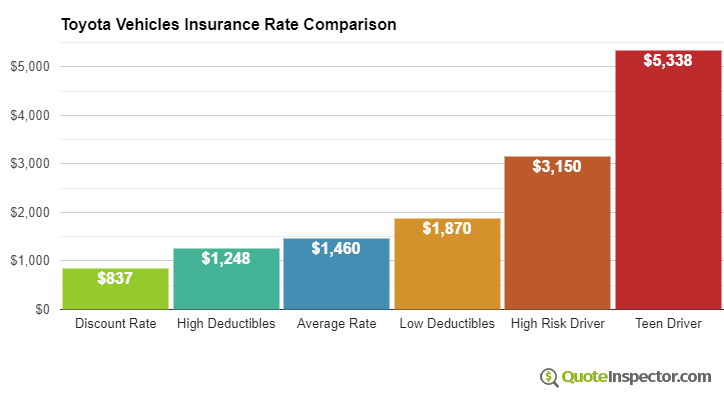 The prior chart utilizes the average rating data for all Toyota models in the table above as an example of how variations in coverage can have a huge impact on car insurance rates. Car insurance rates for a Toyota range considerably based on the model of your Yaris iA, how you drive, and physical damage deductibles and liability limits. If you have a few points on your driving record or you caused an accident, you could be paying anywhere from $1,700 to $2,300 extra every year, depending on your age. 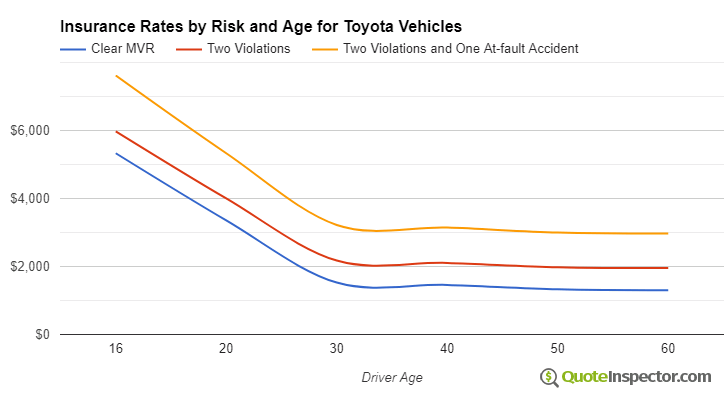 Toyota insurance for high-risk drivers can be as much as 43% to 130% more than a normal policy. A more mature driver with no driving violations and higher comprehensive and collision deductibles may pay as little as $1,400 a year, or $117 per month, for full coverage. Rates are much higher for teenagers, since even teens with perfect driving records will be charged in the ballpark of $5,300 a year. Your home state has a huge impact on Toyota insurance prices. A driver around age 40 might see rates as low as $960 a year in states like Iowa, Maine, and Idaho, or be forced to pay as much as $2,090 on average in Montana, Louisiana, and Michigan. Because rates have so much variability, the only way to know which company is cheapest is to regularly compare rates and see which company has the best price. Each insurance company uses a different method to calculate rates, so rate quotes will be varied. National average data is compiled from all 50 U.S. states for the Toyota models in the rate table on this page. Rates are based on a 40-year-old male driver, $500 comprehensive and collision deductibles, and a clean driving record.